Successfully Added DVR Hard Drive Enclosure and Media Player for 3.5 Inch SATA to your Shopping Cart. DVR hard drive enclosure and media player for 3.5 inch SATA HDD's. Now you can own a high capacity SATA HDD enclosure for TV recording and playing multimedia files without a PC. Have you heard about Tivo and the other amazing DVR's in the market today? As you probably know, a personal video recorder like Tivo makes recording TV for later viewing easy and fun. 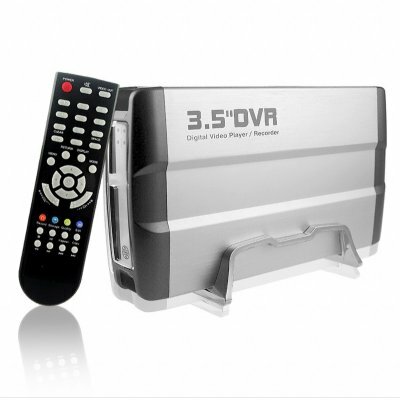 This DVR allows you to digitally record movies and shows from TV without the need to buy removable media. Everything is saved to an internal SATA hard drive. What's more you can record instantly as you watch or schedule your recordings for later. Just like a VCR, with a few simple button presses you can instantly record or schedule a recording for your choice of TV programs. Be in total command of your multimedia experience. You choose the size and brand of hard-drive you want shows saved to. This DVR hard drive enclosure supports SATA disk drive capacities up to 500GB so you can use an old 80 GB SATA HDD you have lying around or go out and buy a new 500 GB one with room for days and days of continuously recording. Saving movies and TV shows are a snap with scheduling and instant recording available in a variety of quality presets so you can record your favorites in high quality and then record your girlfriends soap operas in low quality so you don't waste disk space ;-). In regards to old SATA hard drives that may be sitting around your home or office, this product also acts as the perfect portable hard drive. Attach it to your PC to backup your important work files or load it up with your most cherished media files. For those people who like to constantly download or burn movies, having that extra disk space to store your favorite shows, like the complete first season of Lost, is invaluable. At Chinavasion we continuously expand our product selection to give you the greatest selection of DVR hard drive enclosures for resale, OEM, or company/personal use at direct wholesale prices. We make it easy with direct shipping and no M.O.Q (minimum order quantity), so login now and order yours today. Easy to use 3.5 inch SATA hard disk drive (HDD) enclosure that works as a media player, recorder and portable storage device. Internal formatting (the enclosure's OS can format your drive for you). Files can be loaded through USB drive or connection to PC as well as SD/MMC cards. Note: This product is not sold with a Hard Disk included. You will need to purchase a hard disk separately and format it in FAT32. Who needs an external HDD enclosure? Everyone! Backing up important data should be a priority for anyone living in the modern digital age. In addition, transporting files in excess of 32 GB's is impossible for most USB drives and SD cards. This unit supports HDD devices up to 500GB so it is perfect for the modern digital home or office.